Tango Nuevo (New Tango) by Astor Piazzolla is the result of the merging between the spirit and the musical culture of the Argentine people and the more classic, modern and refined composing techniques, linking Piazzolla to the great European masters: a new music and a break with the almost sacred and untouchable tradition of Tango music. Ensemble Tangueando (Flute, Bandoneon, Piano), has developed an original sound by combining the flute, ancient instrument of the tango, colorful sound of classic shades, with the bandoneon, the emblematic instrument of the Buenos Aires music, and with the piano. 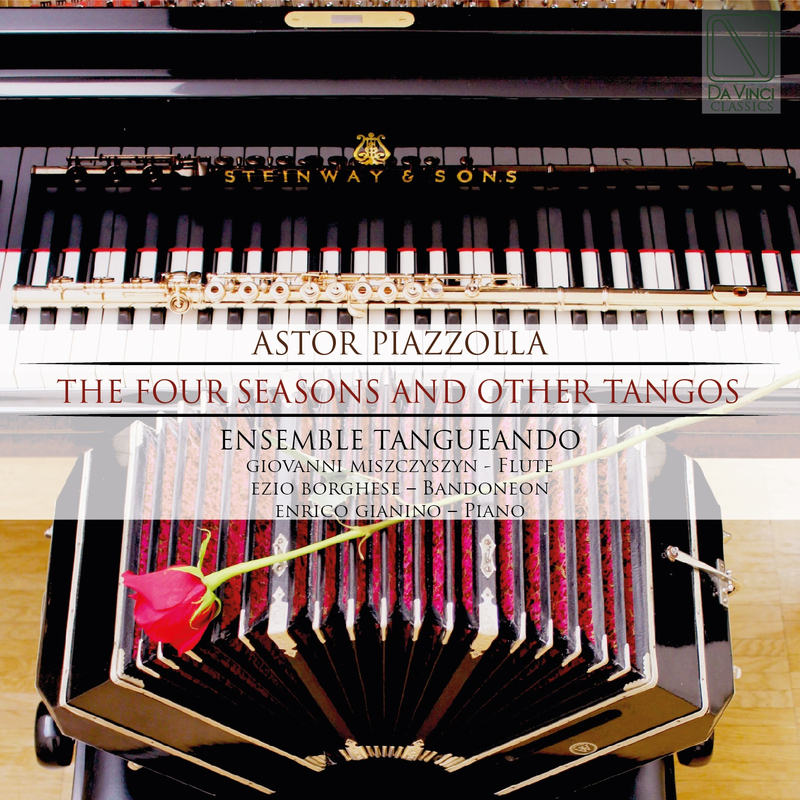 After a period of study and with the perspective of a continuous updating of is repertoire, it offers the most danceable pages of historical tradition, Bardi, Demare, Gardel, Pugliese, Troilo, Villoldo etc, to give us a music milongas, and the most representative pages of the Tango by Astor Piazzolla, in concert form. In recent years he has played in several milongas and concerts. Giovanni Miszczyszyn graduated from the Conservatory “Giuseppe Verdi” in Turin under the guidance of Professor Arturo Danesin, he has increased knowledge of performance practice of the ‘700 Music, studying in parallel with the transverse flute with Barthold Kuijken and Pierre Sechet. He has participated in master classes with Aurele Nicolet, Maxence Larrieu and Jean-Pierre Rampal. Awarded in national and international competitions, he has collaborated, among others, with Nigel Rogers, Fabio Biondi, Gaetano Nasillo. Ezio Borghese began studying the accordion at the music school founded by Professor Berto Berti. He has participated in several music competitions, both as a soloist, that in accordion duo – a category in which he won first prize at the International Competition of Lecco City in 1984, both in orchestral ensemble. Is a part of the sextet of accordionists Accordion Ensemble, overall winner in 1997, the First Prize at the XXII International Competition “Città di Castelfidardo” in the category for chamber groups. Enrico Gianino, graduated in composition at the Conservatory “G. Verdi ” in Turin under the guidance of Silvana Di Lotti and Gilberto Bosco, studying piano with Roberto Cognazzo, Andrea Genovese, Maria Luisa Pacciani and then with Umberto Santoro, graduating brilliantly at the Conservatory” G. F. Ghedini ” of Cuneo. He plays an intense activity of accompanist working with opera singers and soloists such as Steven Mead, Ian Bousfield and Marco Pierobon. He played with Tommaso Lama, Furio Di Castri, Leveratto Piero, Roberto Regis, Aldo Mella and many others.